Feel confident knowing our product won't harm your children, pets or landscaping! put your home insurance in jeopardy! 2 lbs will treat 600-800 sq ft of roof. 10 lbs will treat 3,000-4,000 sq ft of roof. 40 lbs will treat 12,000-16,000 sq ft of roof. Add 3/4 cup per gallon of water, mix well, stirring frequently, allow solution to fully activate for 15 minutes prior to use. To clean stains caused by moss without rinsing just apply and leave the rain will do the rinsing. Allow 60 days to pass before reapplying if needed. For instant results removing stains caused by moss, mold or black algae apply to roof with a pump sprayer or other other spraying methods and use a pressure washer at low speed to rinse the roof, this is the optimal means of cleaning a roof, a scrub brush and hose may be substituted. 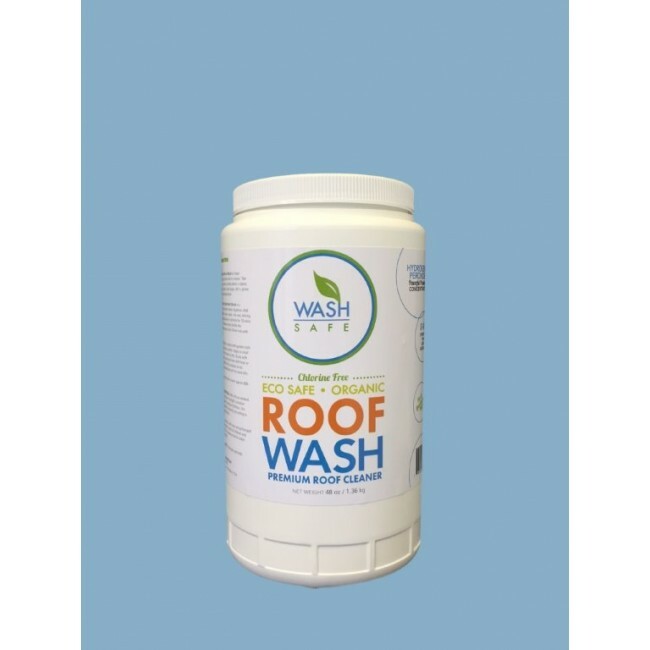 ​To treat roof moss: Apply a coat of Roof Wash to the infected area of the roof. Once applied, you now have the option of letting Mother Nature rinse the roof for you or rinsing it yourself. 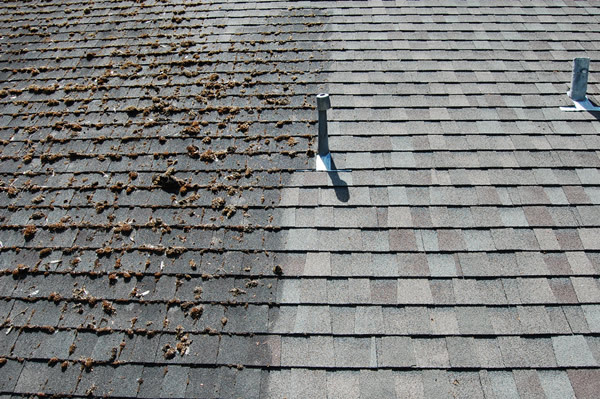 If you do not clean your roof the day of the application you will notice that all of the moss that was sprayed will be turning brown and drying up. This happens very quickly, within the first week after the treatment. The good news at that point is that the moss has stopped eating away at your roof. Now all there is to do is to wait for the sun, wind and rain to remove the moss. With every day that goes by you will notice less and less moss on the roof until the roof is free of the moss. The process usually takes 60-90 days before the moss is completely gone. To treat black roof stains and streaks: Apply a coat of Roof Wash to the infected area of the roof. Once applied, you now have the option of letting Mother Nature rinse the roof for you or rinsing it yourself. If you want to see how much black algae and mold is coming off your roof, catch some of the gutter runoff in a bucket. The water will be black and when it settles there will be coating on the bottom that will look similar to mud. If you do not clean your roof the day of the application, you will notice with every passing storm that your roof stains will become lighter and lighter. A reapplication in some severe cases is necessary 60 to 90 days later to achieve optimum results. The most important factor in this whole process is that after that first application the algae or mold will no longer be eating away at your roof shingles, so right away you have solved the biggest problem. Now you just need to wait until the rain rinses away the mold and black algae. When having my roof sprayed with Roof Wash, I had some run-off over some windows. It dried as the weather was hot and left a film on the glass that was very difficult to remove. Any advice? Some people swear by vinegar and water, then a rub with crumpled up newspaper. Ronda of Courtenay reported she used ordinary dish soap in solution then finished with a product called "Window Cloth" from Norwex (that she purchased from Christine Rayne 250 218 6041) that did a miraculous job.